“The mask maker had died / but the room kept weaving masks, / a galaxy of approaching worlds,” writes Ricardo Xavier Bousoño, in “I Do Not Trust That Word ‘Oxygen,’” one of the poems “translated” by Peter Boyle in Ghostspeaking. In this bold and ambitious book, Boyle creates eleven fictive poets (from Latin America, France, and Quebec) and their work, which he has “translated” for the reader. The practice of “weaving masks” is an old one. One of the most accomplished at this literary practice was Fernando Pessoa (1888-1935), the Portuguese poet who created scores of personas. The persona poem shows no sign of disappearing. 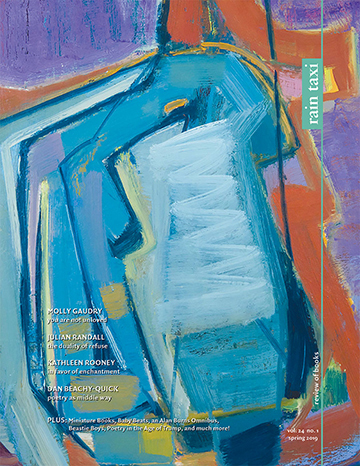 In The Imaginary Poets, edited by Alan Michael Parker (Tupelo Press, 2005), twenty-two writers create a poet and that persona’s poetry. A Face to Meet the Faces: An Anthology of Contemporary Persona Poetry, edited by Stacey Lynn Brown and Oliver de la Paz (University of Akron Press, 2012), a volume of 437 pages, shows the continued appeal of the practice. More recently, Lawrence Ferlinghetti’s Shards: Fragments of Verses (New Directions, 2016), called a translation of the fourteenth century Latin poet Lorenzo Chiera, turns out to be a persona project. Ferlinghetti admitted in an interview (in The New York Times) that the poems are not translations, but his creations. And now we have Ghostspeaking, 368 pages of persona poetry. That phrase of Ricardo Xavier Bousoño’s—“a galaxy of approaching worlds”—best describes Boyle’s undertaking. 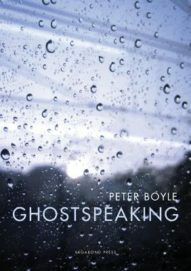 For each of the poets we encounter in Ghostspeaking, Boyle provides not only the poetry, but a biography (and sometimes an “interview”). For example with Bousoño, we learn of his fleeing Argentina in 1976 to avoid the right-wing death squads. With this biographical material, Boyle quickly creates a tension between the life of the poet and his or her work, much in the way a novelist establishes a character. Though the details of the poet’s biography may be only subtly detected in the poems, it shapes the voice, tone, and vision of the poet. Here is Bousoño, who calls himself in the interview here “an apolitical poet” while in hiding in Argentina: “They have instructed me to climb into my coffin / and not get out: / an everyday request.” For an “apolitical poet,” his poetry vividly demonstrates the effect of living under a regime of political terror. The eleven poets here vary greatly in voice and style. Elena Navronskaya, for example, offers prose poems with a fantastical bent: “There were people under the floorboards who were growing wolves’ teeth and learning to fly in the dark caverns that stretch beneath our country.” Lazlo Thalassa writes in numbered sections, each section opening with enigmatic italicized lines set off in parentheses: “(Cloud of unknowing hovers over a frog-pond. A pelican with a stethoscope probes the pulse of the water. )” Antonieta Villanueva writes in short autobiographical prose pieces from her memoir called I Am Not Going to Write My Memoirs. The Montaigne Poet, an anonymous writer whose work comes from a book called The New Essays of Montaigne, seems influenced by Franz Kafka: “He has just fallen off a horse as I have just fallen from a height when a balustrade gave way.” Ernesto Ray creates “spells”: “A star-shaped object rising up / out of the water—five / wavering arms, five / spokes of a chariot wheel . . . ” Maria Zafarelli Strega, whose works were found on notecards, gives us aphoristic prose: “It will not be easy to be born under the earth. I have heard plants tell me that.” Many of the poets write both verse and prose, but the voices of the personas are always consistent. I remember, several years back, a friend sent me a link to a blog where a young woman had just published one of my poems and one of her friends had posted: “I’ve always loved Peter Boyle. Everybody Loves Raymond is my favorite programme. I never knew he wrote poetry.” I wanted to write and say I am not Peter Boyle the American actor, but was I sure? . . . Perhaps in some way I was him, lingering on under his name, slowly acquiring his face now he was gone. Boyle’s sense of humor and his love of layered identity serve him well. Ghostspeaking succeeds in creating memorable poetry that has the added dimension of memorable characters. This is no small accomplishment. It will leave many readers wondering how Boyle was able to create such a diverse cast of personas, such a “galaxy of approaching worlds.” Much more than literary technique makes the poems in this book so effective. In a footnote, we hear one of the fictive poets argue that experimentation for the sake of experimentation fails to provide “the stuff that really matters—the horror, the beauty, the delicacy, the silence.” That’s exactly what Boyle brings us in these “translations”—the stuff that really matters. This entry was posted in Uncategorized and tagged Spring 2017 on May 24, 2017 by Kelly.